Since you will be relying on hundreds or even thousands of worker bees for your honey yield, it’s important to familiarize yourself with the various components of the beehive that serves as their home, workplace and breeding ground in order to ensure an ideal environment. Also, knowing how a beehive is constructed will help you in inspecting, manipulating, and managing your colony. Whether you’re looking to build your own beehive or purchase a complete frame, the bottom-to-top guide below is sure to help you reap the sweetest of rewards. While not necessary, you might find it useful to build your hive on top of an elevated hive stand, allowing you to more easily inspect and manage your colony. Lifting your beehive off of the ground will result in opening up the entrance and likely improving air circulation. The bottom board serves as the floor of the hive, protecting your colony from the ground below. While it is normally constructed from a solid piece of wood, a screened bottom board that improves ventilation may also be installed. The entrance reducer is typically a notched cleat (grass works in a pinch!) that is placed loosely at the hive’s entrance and acts as a barrier in order to control access to the hive, especially at times when your hive may fall victim to invasion. It’s also useful in controlling ventilation during the cooler months. Things like a beehive entrance feeder, which allows for nourishment when natural food resources are scarce, can be attached to the entrance reducer to increase accessibility to things like food within the hive. 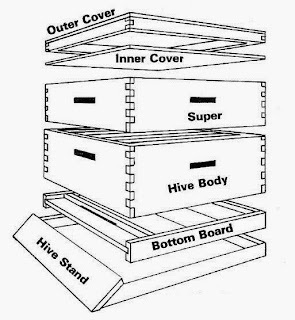 Essentially boxes used to house frames of comb, deep hive bodies are typically stacked on top of each other to provide the bees with two main compartments – the lower deep and the upper deep. The lower deep is the brood chamber and is used as a nursery to raise thousands of baby bees, while the upper deep is used as the food chamber that houses honey and pollen to be used by the bees themselves. In areas that aren’t susceptible to below freezing temperatures, one deep should be fine for both the brood and their food, but food levels should be closely monitored at all times. Designed to prevent the queen from accessing the honey supers, the queen excluder is placed between the upper deep “pantry” chamber and the supers. A wooden or plastic frame typically holds a grid of metal wire or a perforated sheet of plastic with openings that are sized to allow worker bees to move freely throughout the hive, but keep the queen from moving up out of the brood box. While the honey in the upper deep belongs to the bees, whatever you collect from the honey super is surplus and yours for the taking! While identical in design and construction to deep hive bodies, supers tend to be more shallow for easier handling and come in both shallow (5 ¾ inches high) and medium (6 5/8 inches high) sizes, depending on how much honey you are expecting to collect. The lighter weight makes them easier to maneuver and the ability to stack on more honey supers as your hive grows leaves you with the opportunity to increase your sweet harvest year by year. Where all the magic happens, the frames are where the bees build their honeycomb and their ability to be removed easily from the rest of your hive allows for easy inspection and maintenance of your colony. Each frame can also be pulled from the hive using a beekeeping frame grip. 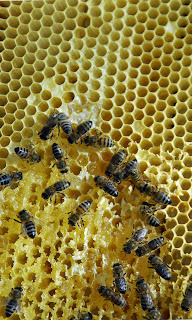 A single sheet of beeswax foundation is held by the frame and houses the combs from which you will extract your honey. Regardless of the construction of your hive, frames come in sizes made to fit deep hive bodies, and both shallow and medium honey supers. The inner and outer covers are stacked at the very top of your beehive. 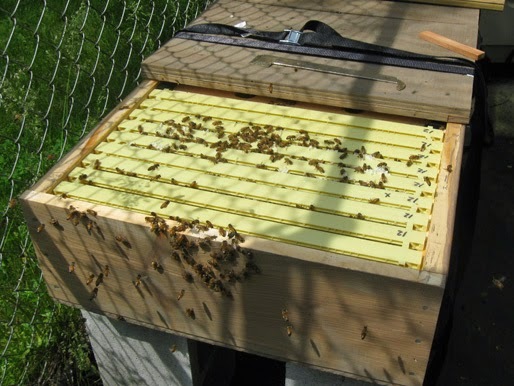 The outer cover is a shallow tray with a hole in the center and may have a notch along one of the lengths of the frame to be positioned at the front of the hive for added ventilation. The outer cover acts as a rooftop and is typically covered with some kind of weatherproof material, like cedar shingles or aluminum flashing, for added protection. Cypress wood resists rot and is long lasting, so it’s a great option when you’re looking to buy or build your covers. Stay tuned for more from our Beekeeping for Beginners blog post series! For any questions or comments, and all of your beekeeping needs, visit us at www.parisfarmersunion.com!